iDOLM@STER for PS4 project has been announced just now for PS4. 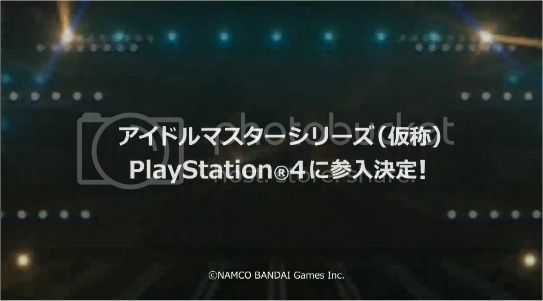 The iDOLM@STER Platinum Stars, stated for PS4 release in 2016! EDIT: Saw the screenshot on the community site. Dang it, I step away for a few minutes, and that happens. Dang it! Heh, it's okay, you only missed that shot, and I believe a 2014 date. It went by too quickly. So iM@S on PS4 is great. Not sure what the "new development for home consoles in the near future" could be, but sounds interesting. This is probably the only picture were getting right now. Gee...I wonder what's Kuroi going to do now? And what of Jupiter? Produce male idols plz? The title of this thread says anything we ever wanted/needed to know. I want male idols to be in their own separate game. iM@S GS? I want ML and CG idols to be in their own separate game too. Far, far away from this title. Of particular note, the last two (real) paragraphs. What I find a little odd about this is the word choice - he uses the word challenge to describe what they're doing. Maybe in a technical sense. All he says here is that, other than the PS4 announcement, they're planning on announcing the development of another console game in a few days (at TGS is my bet). Whether or not it's Im@s-related, he doesn't actually spell out. Yeah, I know they announced a Gundam game at the same time. Not keeping my hopes up, but still would like to be pleasantly surprised.